Very poor mouse input due to aggressive acceleration. A controller is highly recommended, though Xbox controllers may require a fix. See Controller support. 8.3 Error "A Ubisoft service is unavailable at the moment"
All Windows versions require Uplay DRM. Included in the Deluxe Edition. No longer available for individual purchase. Version 1.01 patch can be downloaded here. 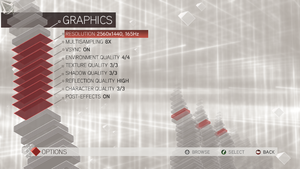 Among other fixes, it adds ATI Eyefinity support and provides some performance enhancements for multi-core processors. Further delete or rename any folder present here (e.g. en, it or whatever else installed languages might be). The save folder was relocated in a November 23, 2012 patch. If you change the XML config file to allow offline play, or if you select the Uplay launcher to stay offline in the options, then your progress and games will NOT be saved! You CAN turn cloud-sync OFF in the options, but you must allow Uplay to go online to allow Assassin's Creed II to save games to this location on your local hard drive. 16:9; other aspect ratios are letterboxed. Force triple buffering in graphics card control settings. The frame rate is capped at 62 FPS but allows 120hz refresh rate. Aggressive mouse acceleration. Can't be disabled. X and Y inversion can be set independently for first-person, third-person, or both. A fix is needed for wireless Xbox 360 Controllers and Xbox One Controllers; see Controller support. Controller support must be enabled in the options menu on first launch, which requires mouse. Xbox 360 Controllers and Xbox One Controllers are not detected correctly resulting in incorrect button mappings due to a driver bug. Windows 10 users can find a fix at the bottom of this section. 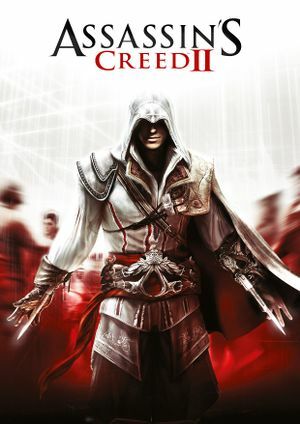 Download the latest version of x360ce and extract it into the Assassin's Creed II installation folder. Run x360ce.exe and confirm the creation of x360ce.ini and xinput1_3.dll. In "x360ce Presets" (located towards the bottom of the controller window), choose "Controller (Xbox 360 Wireless Receiver for Windows)." Check that all buttons are working correctly. On the "Option" tab, choose Hook mode: *Compatibility*. Press "Save" to save .ini file, then exit. Run the game and verify that the controller is working correctly. 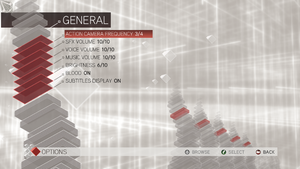 Download this and extract it into the Assassin's Creed II installation folder. It seems to be a correctly-configured setup for the above x360ce.exe that is not easily reached by most, and will override any in-game controller settings. Triggers, D-Pad and other buttons will function exactly as they do in the subsequent series installments. This option works for Windows 10 users. Press 'Download Link' and you'll be taken to a Google Drive folder. Select Windows 10 and download both the x360ce.ini and xinput1_3.dll. Place them both into the Assassin's Creed II installation folder. 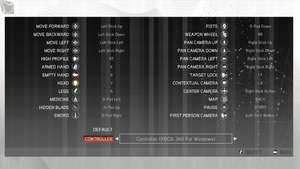 Download 32-bit Xbox One controller driver or 64-bit Xbox One controller driver and install. Setup a x360ce profile and drop x360ce.ini and xinput1_3.dll into the installation folder. Separate sliders for SFX, Character Voices and Music. Some in-game dialogue is spoken in Italian. Translations are displayed in the subtitles (Confirmed for English version of the game). Available only at local distributors. Available only at local digital distributors. 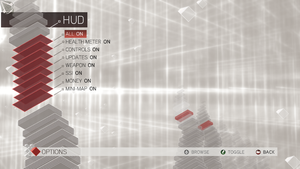 Use Helix Mod: Assassin's Creed 2 for better support. 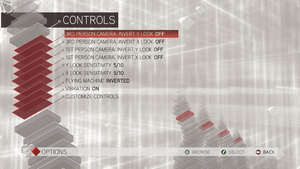 This issue is cause by the Nvidia Control Panel forcing graphical settings on. Select "Adjust image settings with preview". Select "Let the 3D application decide". Default mapped keys do not work as they should. Error "A Ubisoft service is unavailable at the moment"
Updates most of the textures and particle effects in-game with a mix of Assassin's Creed Brotherhood textures and custom textures. Does not support Lion X (OS 10.7). Should work on any versions 10.8 and above. ↑ 1.0 1.1 File/folder structure within this directory reflects the path(s) listed for Windows and/or Steam game data (use Wine regedit to access Windows registry paths). Games with Steam Cloud support may store data in ~/.steam/steam/userdata/<user-id>/33230/ in addition to or instead of this directory. The app ID (33230) may differ in some cases. Treat backslashes as forward slashes. See the glossary page for details. This page was last edited on 22 April 2019, at 08:23.